Belgium has a large variety of top-fermentation beers in the full range of density and colour, flavour and aroma, with or without bottle conditioning: “Spéciale Belge Ale” amber beers, Trappist beers, abbey beers, white beers, heavy blond, saisons. Top-fermentation beers bear the signature flavour of the brewing water, selected malts, unmalted wheat, rice or maize, hops, herbs and spices and yeast. Unlike the extremely low mineral content of pilsner brewing water, brewing water for topfermentation beer is high in calcium, magnesium and their salts, sulphates and chlorides. These range from pale to amber or dark brown, coloured in the kiln or torrefied in the drum (direct flame). 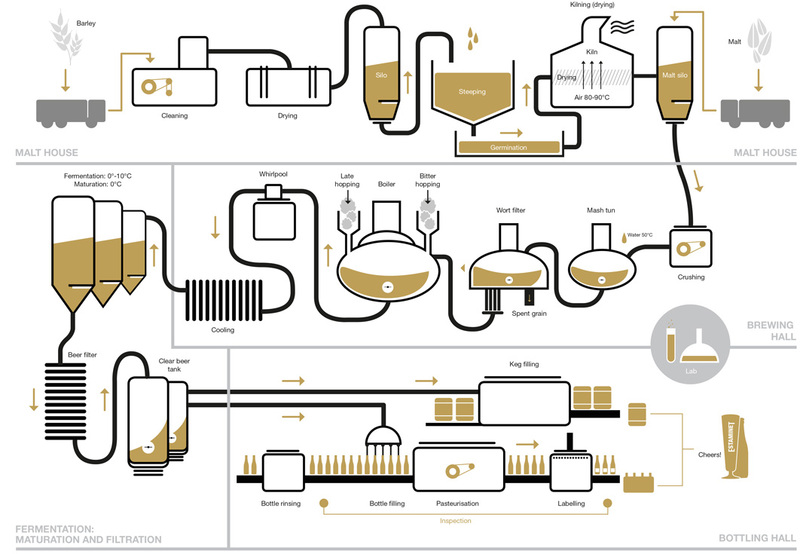 It is mainly the malt grain that determines the basic flavour of topfermentation beers. These do not contain any proteins and are used to reduce the protein concentration in the malt, which is sometimes too high. To obtain heavy beers and a high degree of fermentation. Bitter hopping: for top-fermentation beers, high alpha, non-sour hop varieties added at the start of the boiling process are mainly used to bitter the beer. 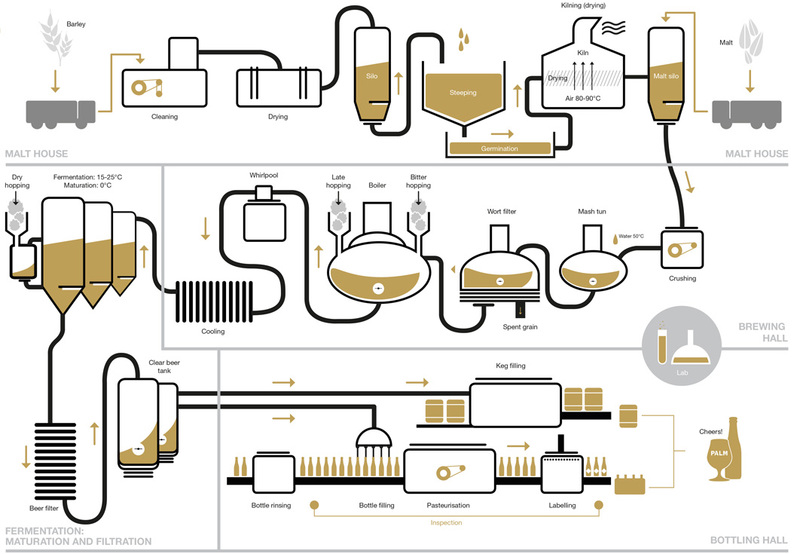 A selection of aroma hops is added at a later stage and provides the desired aroma profile. Late hopping: aroma hops are added at the end of the boiling process in order to prevent the hop aroma from being lost due to evaporation as the brew is boiling. Dry hopping: extreme hop aromas are obtained by adding aroma hops after the fermentation process, so that alcohol-soluble hop oils are also released. The use of hops became widespread in the 15th century. Before then, all beers were flavoured with herbs and spices. However, herbs and spices still contribute to the complexity of the flavour and aroma in hopped beers. A blend of herbs and spices is known as a “gruut”. Some frequently used herbs and spices are bog myrtle, rosemary, coriander, juniper berry, cinnamon, anis seed, cloves, sage and bay leaf. A yeast strain selected from the top-fermenting species known as Saccharomyces Cerevisiae, which is active at high temperatures (ambient temperature 15°C to 25°C), is used to ferment the brew. Thanks to its top-fermentation beer brewing tradition handed down across the generations, PALM Breweries has amassed an impressive collection of yeast strains. Every yeast strain has its own “character”; in other words, its physical behaviour during fermentation and the aroma it creates. After the main fermentation, which takes 5 to 7 days, the brew is subjected to a warm maturation phase (lagering) at approximately 20°C until the apple scent (acetaldehyde) and the rancid butter odour (diacetyl) have disappeared. After this the brew is chilled to 0°C. The cool temperature helps to flocculate excess tannins and proteins (forming cold turbid matter) and to precipitate the yeast, which further refines the flavour. • At the end of the fermentation and lagering process: approximately 2.5 g CO2/l. approximately 4.7 g CO2/l for keg filling, or approximately 5.7 g CO2/l for bottle filling. • With secondary fermentation in the bottle, the carbon dioxide content reaches 6 to 10 g CO2/l. Bottle conditioning is a typical Belgian speciality. Whilst Belgian local beers were traditionally intended for everyday consumption, the Trappist monks brewed stock beers with a high alcohol content (8%, 10% or 12% ABV), all of which were bottle conditioned with high carbon dioxide content (up to 10 g CO2/l). Alcohol (ethanol) has an unctuous, sweet taste. As a result of this, heavy beers lose their thirst-quenching qualities. In order to counterbalance this, heavy beers are bottleconditioned: extra sugar and yeast are added to the beer when it is bottled or kegged. The yeast in the sealed bottle converts the sugar into extra alcohol and carbon dioxide gas, which can increase from 3 g CO2/l to 10 g CO2/l. This extra carbon dioxide acidity neutralise the sweetness of the alcohol, which restores the thirst-quenching qualities. Yeast present in the bottle also protects the beer from ageing through oxidation. The oxygen which is already present or which reaches the beer by infiltration is absorbed by the yeast before it can cause any damaging oxidising reactions that could cause the beer to taste old. Having yeast in the bottle is therefore essential for stock beers. • Stock beers: if the intention is to better protect the fine aromas and flavours against ageing and to give the beer a longer shelf-life (e.g. for export), yeast in the bottle will provide the best results. • Heavier beers: for beers with an alcohol content above 5% ABV, the rule of thumb is that there should be as many grams of CO2/l as % ABV. A beer with an alcohol content of 8.5% ABV therefore ought to have 8.5 g of CO2/l. The acidity will bring the sweetness back into balance, which will in turn restore the beer’s thirst-quenching qualities. The brewing water for traditional pilsner has very low mineral content. For other types of beer, the brewing water has a higher salt content. Pale malts with a low protein content. Quality malt is made from summer barley. Winter barley has a thicker husk, contains more tannin and gives the beer a sour, stale taste. These do not contain any proteins and are used to lower the protein content in malt, which is sometimes too high. The German “Reinheitsgebot” (beer purity law) does not permit the use of maize or rice, which sometimes results in beers that have much too much bite or which are not as refreshing. Bitter hopping increases the digestibility and thirst-quenching qualities of a beer, provided that the bitterness does not cause a sour taste. The choice of hop variety, the quantity used and the time when it is added to the brewing boiler play a part in determining the flavour and aroma profile: bitter hopping is carried out at the start of boiling and aroma hopping at the end. A yeast strain selected from the bottom-fermenting species known as Saccharoymyces Carlsbergensis, which is active at low temperatures (0°C to 10°C), is used to ferment the brew. Bottom-fermenting yeasts, originating from the Czech Republic, remain active at these low temperatures, unlike bacteria. Bottom fermentation was therefore a good method for brewing beers that would not turn sour. Maturation of bottom-fermentation beers occurs at 0°C in a maturation (lagering) tank. At 0°C the bottom-fermenting yeasts remain active and continue to convert sugar into alcohol, so that, depending on the pressure in the maturation tank, the carbon dioxide content increases to approximately 5 g CO2/l.